Meet the Andersons! 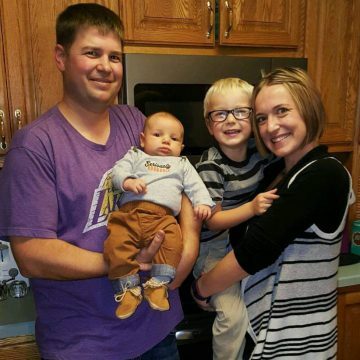 We met Danielle Anderson through our work with Montana No Kid Hungry, and were inspired to share her family’s personal dinner journey here. Danielle and Dane Anderson and kids Finn (5) and Oliver (1), of Plentywood, Montana. In addition to taking a little help from TFDP when needed, the Andersons have followed the example set by Dane’s parents and made family dinner a priority. Danielle says that she grew up in a home with working parents who often couldn’t make family dinners happen, and she was always jealous of friends whose families did gather around the table. When she and Dane married, he came from a home where family dinners were important, so the Andersons have made sure to set that example for their own kids. In their ongoing quest to keep table time engaging, they have a no technology rule and limit distractions so they can all connect during dinner. Danielle also recommends making sure that the meal preparation itself is fun, rather than a “chore” that needs to be endured. The Anderson family likes to turn on music while they cook and will sometimes find themselves having a spontaneous dance party in the kitchen. When there’s time, eldest son Finn gets in on the action and helps prepare the meal; when there’s not, Danielle and Dane encourage letting the kids do something that keeps them happy while the parents work to get a fast meal together, even if it means indulging in a little screen time. As long as the screens don’t follow the kids to the table, avoiding the pre-dinner meltdown sometimes means doing whatever it takes! Danielle says the whole family loves to be adventurous and try new flavors at dinnertime. She loosely follows a “themed” meal plan each week, which includes Meatless Monday, Taco Tuesday and “Ethnic” Thursday — all of which present great opportunities to try new recipes and flavor combinations that fall outside the usual fare for most families with young children. Do you have your own family dinner project to share with us? We’d love to hear from you and consider featuring your family! Contact Us.